With a Baedeker in hand – a popular guidebook written for English visitors to Europe – arrivals new to Florence at the turn of the twentieth century gained a history of the city. Offering guidance to all manner of services, its information-rich pages instructed the visitor on how to navigate the city and its environs by electric or steam tramways, omnibuses, and cabs; where to find Havanna Cigars or Confectioners or Cafés; the locations of the post office, telegraph office, and British consulates; suggestions for English-speaking churches, physicians, and chemists; advice for the best baths, shops, booksellers, photographs and photographic materials (significant, one would imagine, to Loy’s photographer husband); recommendations for artists and teachers of music and Italian; and information on theaters, festivals, and the flower market. 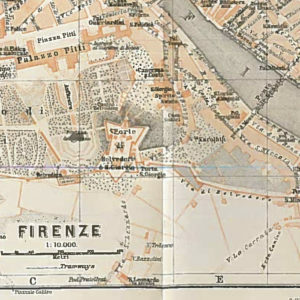 Arriving in Florence in the winter of 1907 with her husband Stephen Haweis, Loy might have unfolded the delicate pinkish and white Florence map inserted in the Baedeker’s copious chapter on the city. Tracing the route from the train station to their new home in the Arcetri hills outside of the city, they could cross the Ponte alla Carraia across the Arno river and take the Via Serragli to the Porta Roma, or perhaps cross the Ponte San Trinita to the Via Maggio and, at the Pitti Palace, head west on the Via Roman to the Porta Roma. 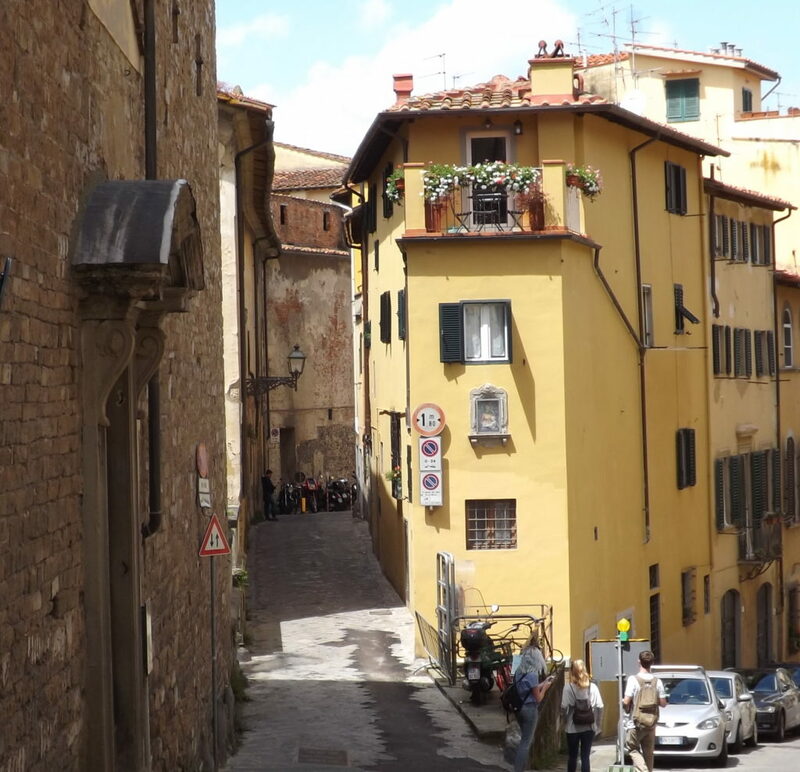 From this ancient gate, hilly roads would wind up to their first home in Florence. At the busy Stazione Centrale Santa Maria Novella, early twentieth-century visitors consulted the Baedeker to find where to meet the “omnibuses” or a “cab,” forewarned that “there is often a scarcity of conveyances” (Baedeker’s Northern Italy 457). From the station, Loy and Haweis took a horse-drawn carriage to travel through town, southward across the Arno river into the hills, dotted with villas and splendid views high above the city, to arrive in the Arcetri area and their new home, the Villino Ombrellino at #11 Piazza Bellosguardo (Burke 105). Pregnant with the child of her lover, Henry Joël Le Savoureux, the Parisian doctor treating her for “neurasthenia after the death of Oda [her first child],” Loy had agreed to move to Florence with her husband to avoid scandal when Haweis agreed to claim the child (Burke 102). As a condition, he demanded that they relocate from Paris to the Villino Ombrellino when a friend offered them her remaining lease for the year, lasting until summer (Burke 104). In Florence, they found an “Italian city with a strong English accent” and a well-populated Anglo-American community (Harold Acton, quoted by Burke 106). 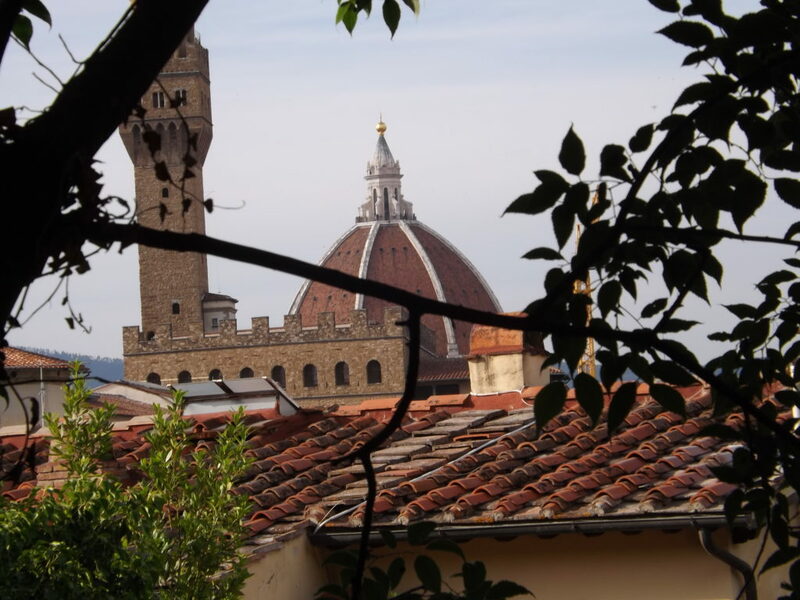 In these first months, at a distance from the city that could feel isolating for the pregnant Loy, the couple – or sometimes just Stephen – began acquaintances with other English residents living in Florence. After several months at the Villino Ombrellino, the couple and the baby Joella moved into the city. Loy found herself amidst the jostling energies of avant-garde invaders in Renaissance-laden Florence. 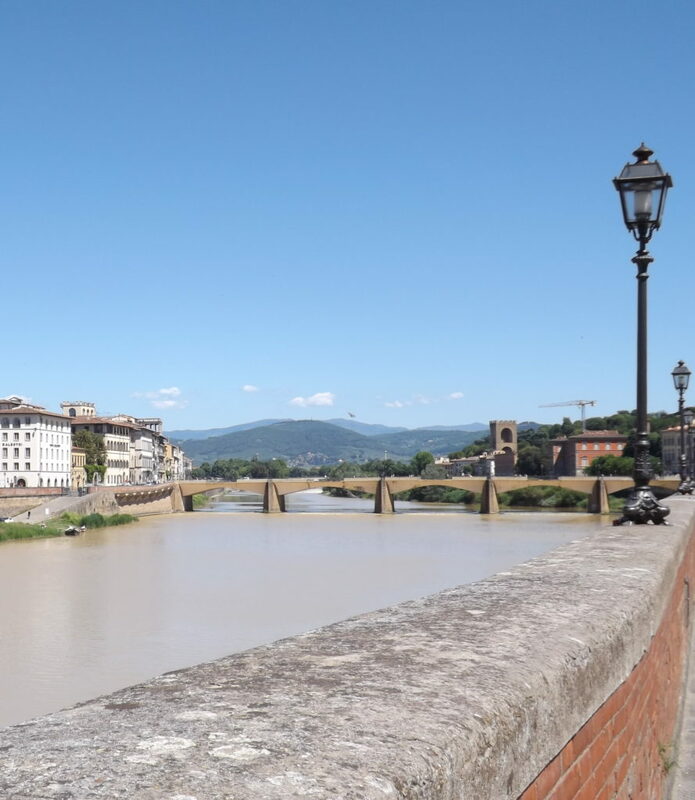 A nice walk from the Centro, or city center – beginning perhaps at the Duomo – takes you quickly to the river Arno, where you can stroll along the walls lining its banks on either side. The river Arno cuts diagonally through Florence, and multiple bridges take you across to the Oltrarno. The “Oltr’arno” the Baedeker tells us, is Florence’s “left bank,” a district containing about “one-fourth” of the city (536).The Ponte Santa Trinità lands one near the peaceful domed basilica of Santo Spirito, a Romanesque church begun in 1436. 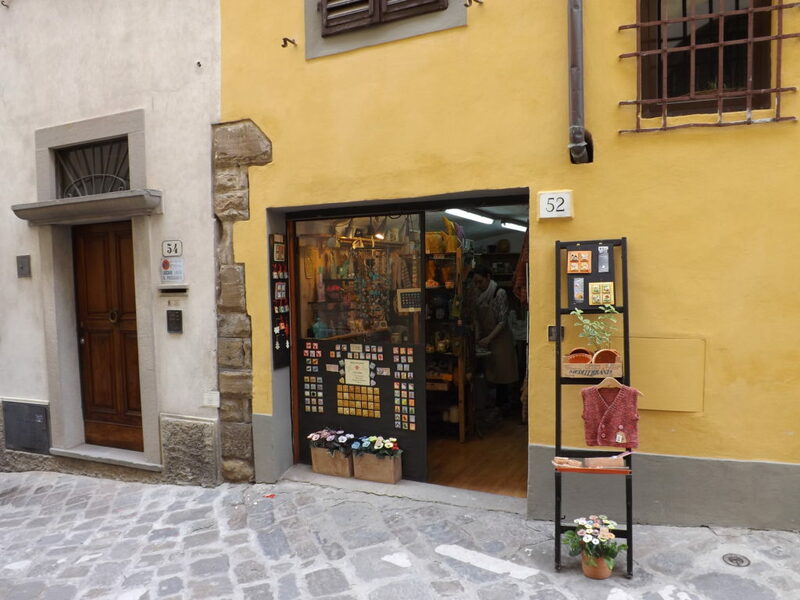 For the most direct route to the Costa di San Giorgio, the hilly street where Loy and Haweis moved, take the Ponte Vecchio, picturesquely lined with shops and often congested with pedestrians and shoppers. 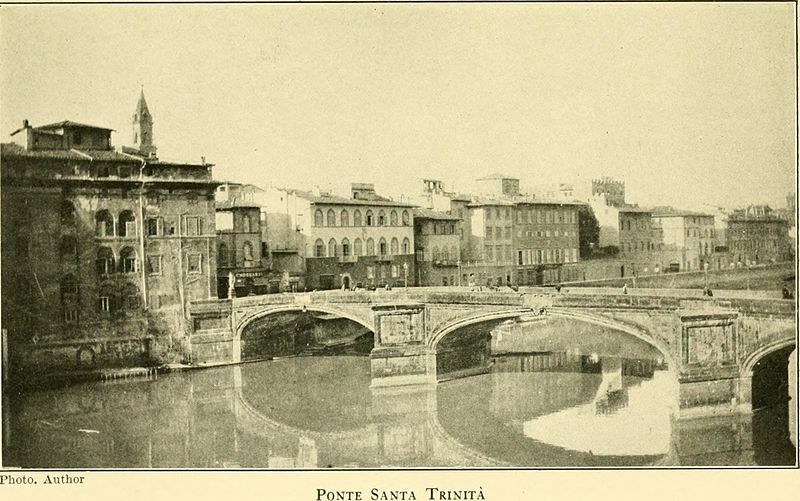 The 1906 Baedeker directs visitors to the “quaint and picturesque” Ponte Vecchio bridge, “flanked with shops, which have belonged to the goldsmiths since the 14th century” (Baedeker’s Northern Italy 537, 538). 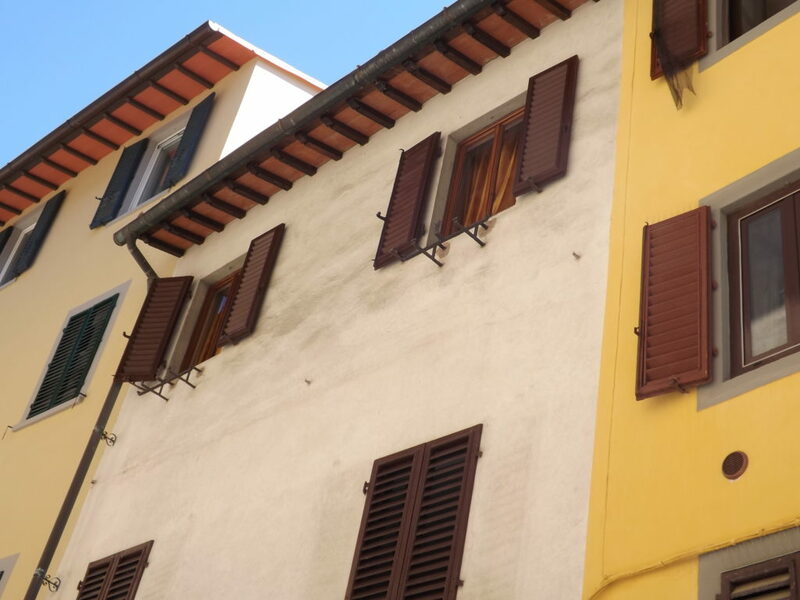 Stepping from the Ponte Vecchio into the Oltrarno, you will find streets of busy shops, cafés, and restaurants within a few hundred yards of the Pitti Palace and the entrance to the expansive Boboli Gardens. Within a few dozen steps of the bridge, the base of Costa di San Giorgio, the street Loy inhabited for years, begins in the Piazza Felicita. Let us pursue Loy’s traceries through the Oltrarno. Costa di San Giorgio winds upward through the Oltrarno. 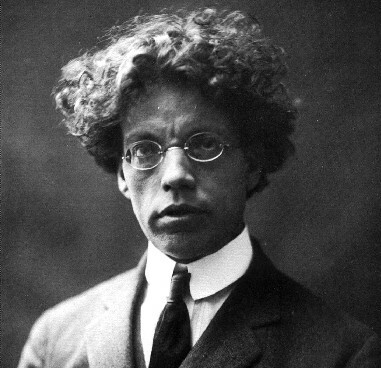 By spring of 1908, Haweis rented a studio on the street while he and Loy lived in the Villino Ombrellino. On the same side of the Arno as the Arcetri area but a steep descent from the hill-top Villino Ombrellino when coming toward the city (and an arduous hike back up), the studio location likely helped prompt the couple’s subsequent move to the same street later that summer to a rented apartment. Costa di San Giorgio is the street to the left, seen here at its intersection with Costa Scarpucia, looking downhill and toward the city. Loy’s home is a few houses down on the right. 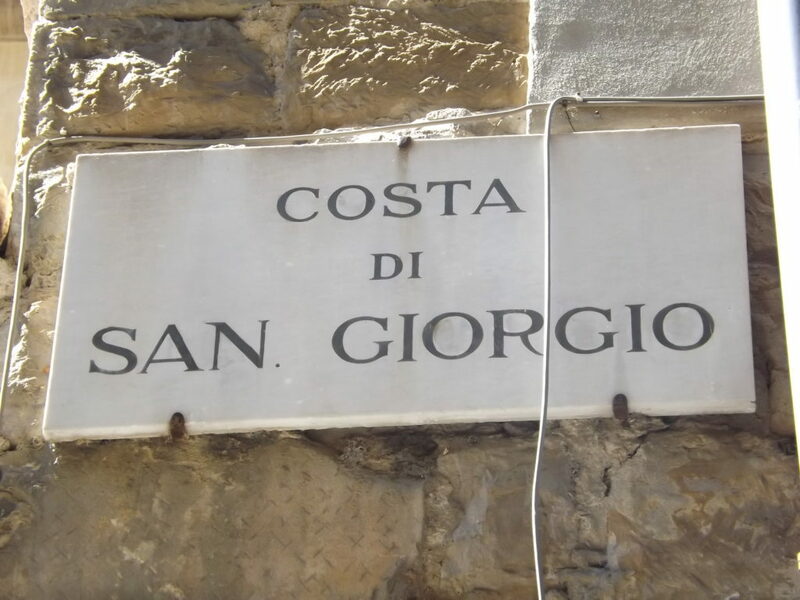 To find Costa di San Giorgio, cross the Ponte Vecchio into the Olr’arno area. 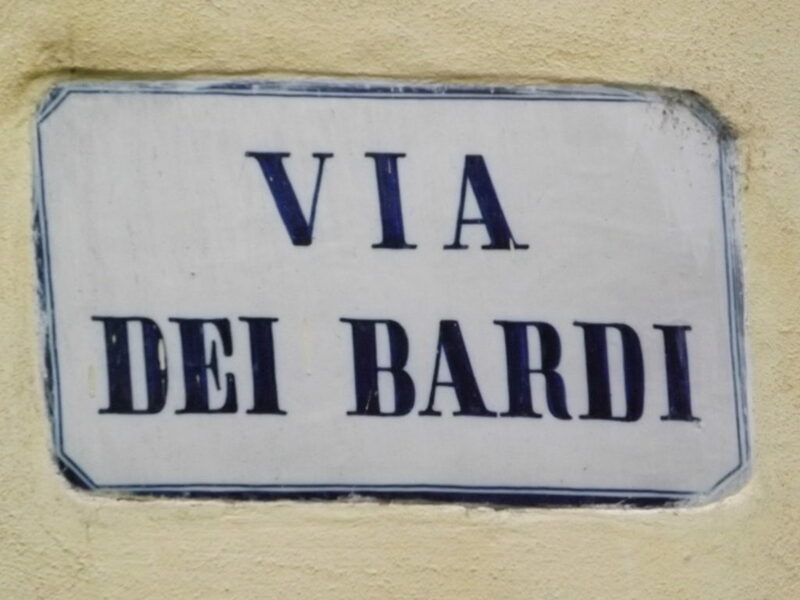 One can then turn left soon after the bridge, onto the Via dei Bardi, running just above and parallel to the Arno. After a short block, a set of steps on the right takes you to Costa San Giorgio. 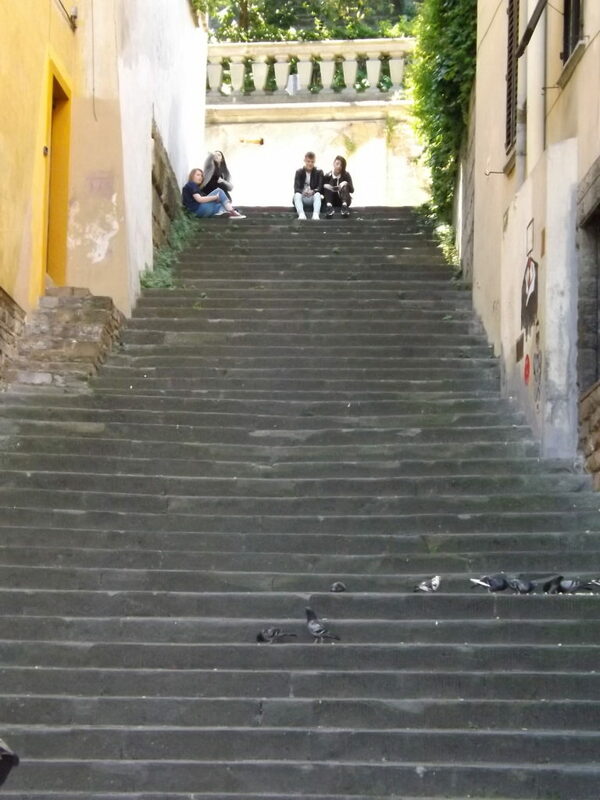 Turn left at the top of the steps and climb the hilly street. Rather than taking the steps, you can start your climb up the Costa di San Giorgio from its lower origin point. Just after the Ponte Vecchio, cross over the Via dei Bardi (rather than turning onto it) and almost immediately enter the Piazza San Felicita on the left. 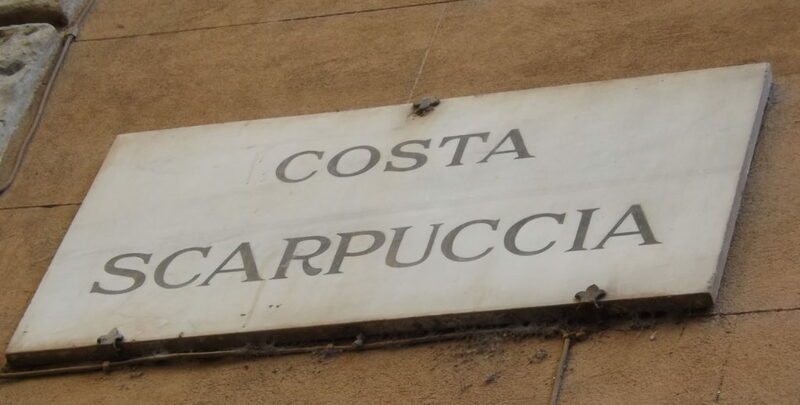 The Costa di San Giorgio begins at a narrow opening between two buildings in a far corner of the Piazza. If you find yourself in the Piazza, however, stay for a while to contemplate how Loy’s customary path through this piazza suggests tantalizing associations across time between British poets in Italy (see Italian Retreats). Imagine Loy crossing in front of the Church of San Felicita. En route, she would routinely pass by Casa Guidi, the home of Britain’s famously Italianate Victorian poets, the Brownings, identified by a 19th-century plaque above the door and by the Baedeker: “No. 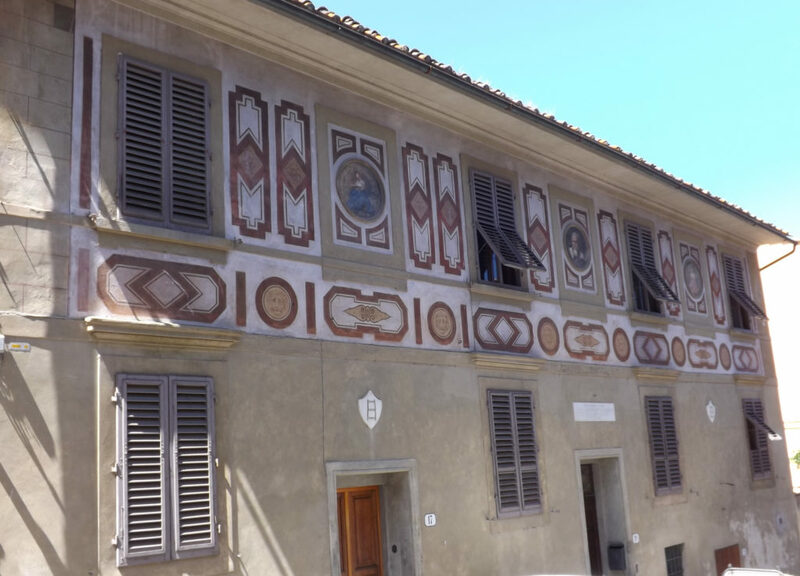 9, Piazza San Felice, is the Casa Guidi, in which Robert and Elizabeth Barrett Browning lived from 1848 till the death of the latter in 1861. . . See her poem, ‘Casa Guidi Windows’” (547). Standing under the windows Barrett Browning once occupied, an intriguing thought occurs. 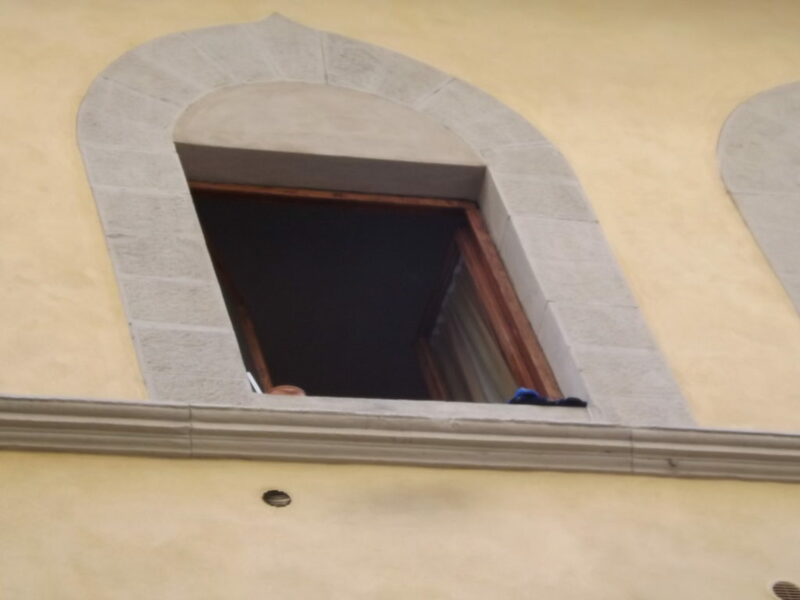 Would Loy have heeded the Baedeker’s advice to read the older poet’s two-part poem, “Casa Guidi Windows” spoken by a female “I” positioned at the window of her home? 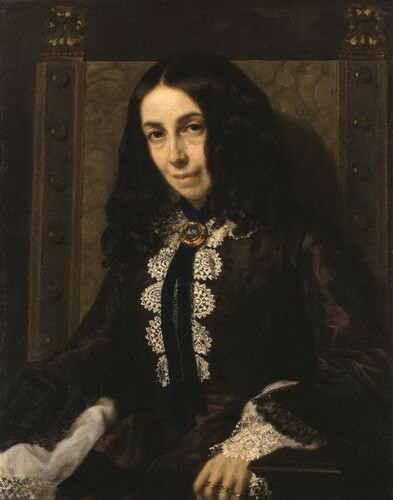 A British woman in Italy, Barrett Browning’s poem witnesses the initial stages (the late 1840s) of the Risorgimento in Florence, the unification of Italy that would only be successful later in the century. Would Loy, the twentieth-century poet, have been struck by Barrett Browning’s deliberate positioning of a woman at the window of her Italian home in the mid-nineteenth century, looking onto the piazza at the tumult and energy of the street? disclaiming the poem as anything but a “simple story of personal impressions.” Muting the socio-political – while defiantly personal – project of the poem, these prefacing comments speak to the negotiations of gendered authorship that Loy confronted some six decades later. Bent bridges, seeming to strain off like bows. And pilgrims leave their souls here in a kiss. 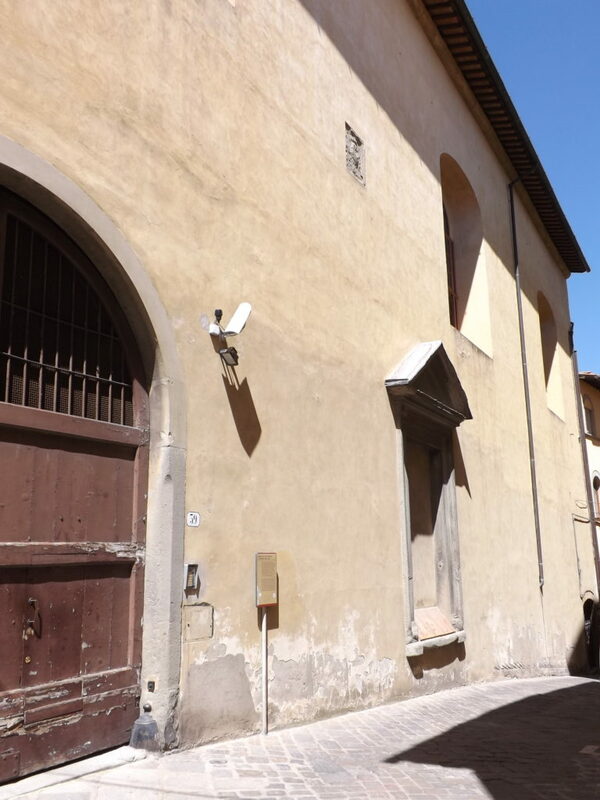 If you are standing in the Piazza Santa Felicita, ponder the imagined lineages conjured by this spot. 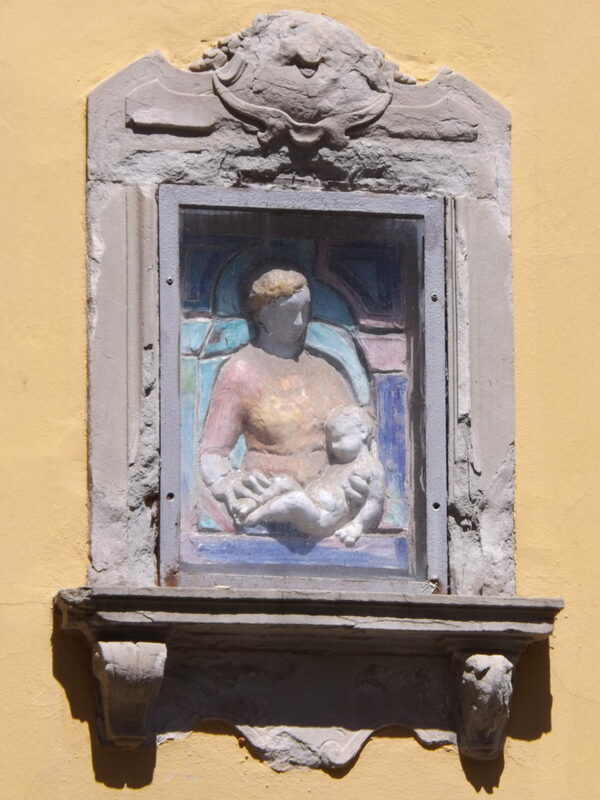 Was “Casa Guidi Windows” a prompt to Loy in writing her own views from Florence windows? 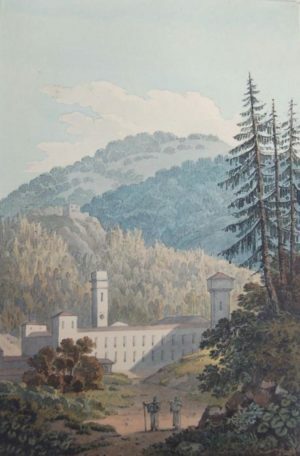 Did she remember Milton’s praise as paradise for the mountain resort she visited from Florence (and likely saw the plaque to him there), or the other poets and artists who had earlier visited the Italian mountain top? These imagined poetic intersections, however fanciful, point to the complexities readable in her Italian poems and attending Loy’s developing sense of herself as a poet. A connection to earlier British poets is both suggested and troubled by Loy’s own poetic focus on places inhabited by her poetic ancestors and the points of view adopted. 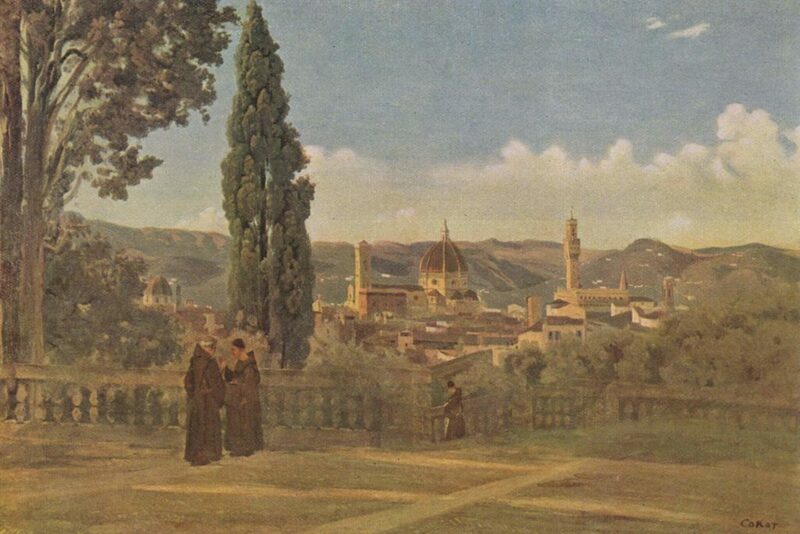 For example, Barrett Browning’s imaginative evocations of “Florence wanderings” serve in her poem as a way of enumerating an Italian history justifying the mid-nineteenth century struggle for national identity. 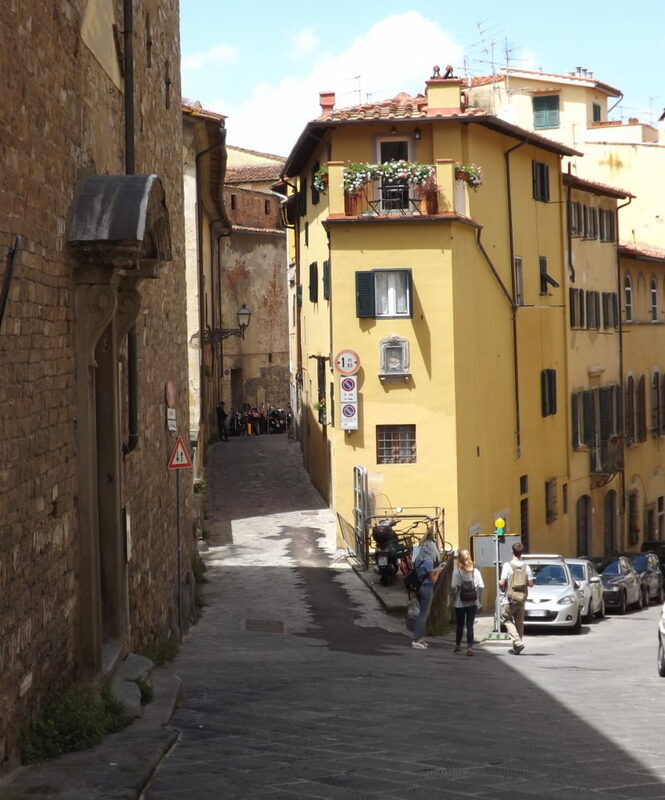 Loy, wandering (and writing about) the early twentieth-century streets of Florence, might also recall Barrett Browning’s description of standing in the spot of Loy’s first Florence home, in the “Tuscan Bellosguardo. 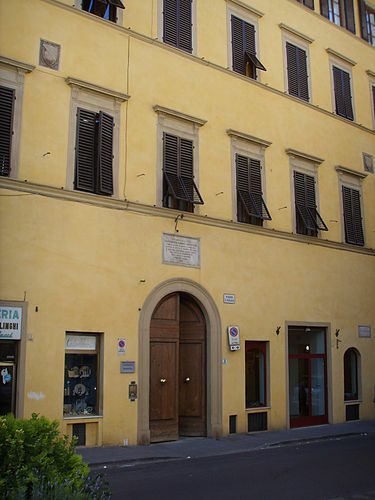 . . Where Galileo stood at nights to take / the vision of the stars” (“Casa Guido Windows”). Galileo, and then Barrett Browning, gazed upon the stars from Loy’s first home, the “Villa dell’ Umbrillino” in Arcetri. 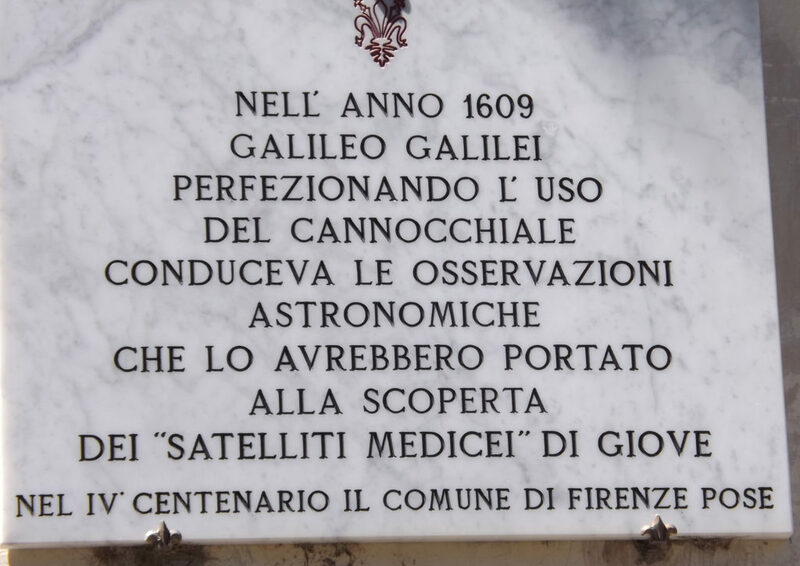 Upon her arrival in Florence, Loy’s Baedeker taught her that her newly rented villa was previously “occupied by Galileo in 1617-31, and now marked by his bust”(552). Just as Loy’s paths crossed those of the Renaissance astronomer, his observational power stands as an authorizing presence in Barrett Browning’s own socio-historical, political, and personal observations of Italy. Imagine: Loy gazing upon the stars from the Villa dell’ Umbrillino, possibly thinking of Barrett Browning and Galileo walking these Florentine spaces before her. Indeed, Loy’s move to Costa di San Giorgio placed her just down the hill from Galileo’s home on that same street, another coincidence in adjacency. Sixty some years after Barrett Browning’s poem, Loy moves to the Costa San Giorgio, just above the Casa Guido, and down the hill from Galileo’s house at #13 Costa San Giorgio. 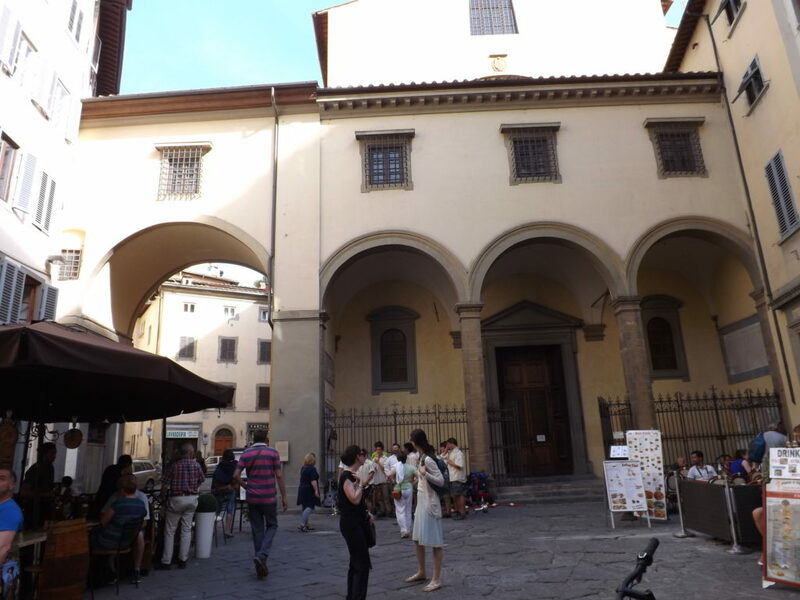 This layered sense of place suggests how Loy “take[s] the vision” of Florence (to use Barrett Browning’s words) as a traversal of poetry, space, and time, creating imaginary circuits of vision for the poet and for the Florence wanderer reading her poetry. 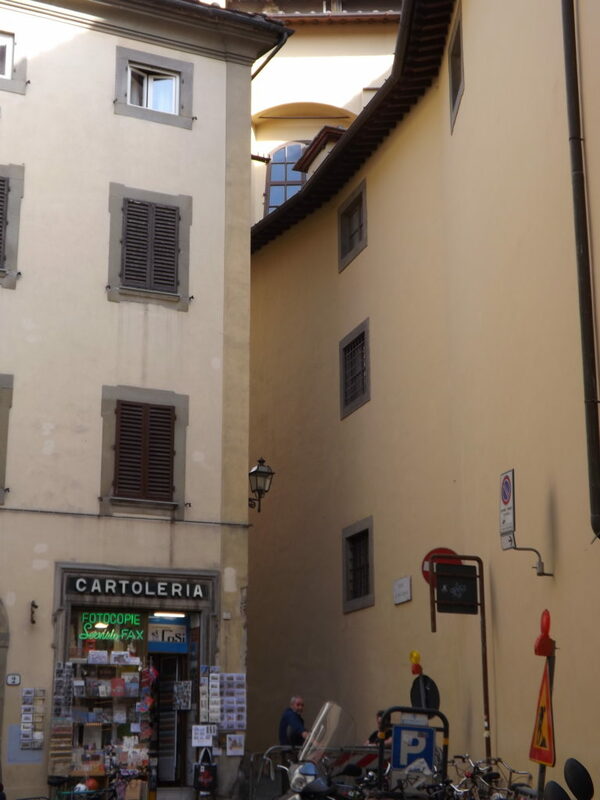 Having mused on these possible intersections, amble past the Casa Guido to enter the Costa San Giorgio through the narrow opening between wall and church, as Loy would have done many times. The Costa di San Giorgio, as home and studio, marks the beginning of her modernist path. Loy’s handwritten self-address on a 1914 letter to Carl Van Vechten. Loy’s expanding circle of avant-garde friends found their way to #54 Costa di San Giorgio. In 1912, Gertrude Stein and Alice B. Toklas visited her home and studio while staying with Mabel Dodge at the Villa Curonia. Loy gifted Stein with a small statue of a “Black Madonna,” and they shopped together in the Oltrarno. 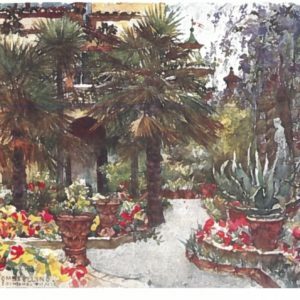 In 1913, Gordon Craig moved next door for a period, and also that year, the American artist Frances Simpson Stevens arrived in Florence from America to rent a room from Loy after Haweis left Florence. The two women became close friends and together investigated the burgeoning Futurist scene, while also attracting Futurist artists to Costa di San Giorgio (Burke, Becoming Mina Loy). 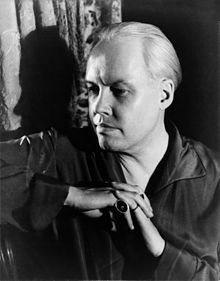 Loy often wrote to Carl Van Vechten from her Costa home. 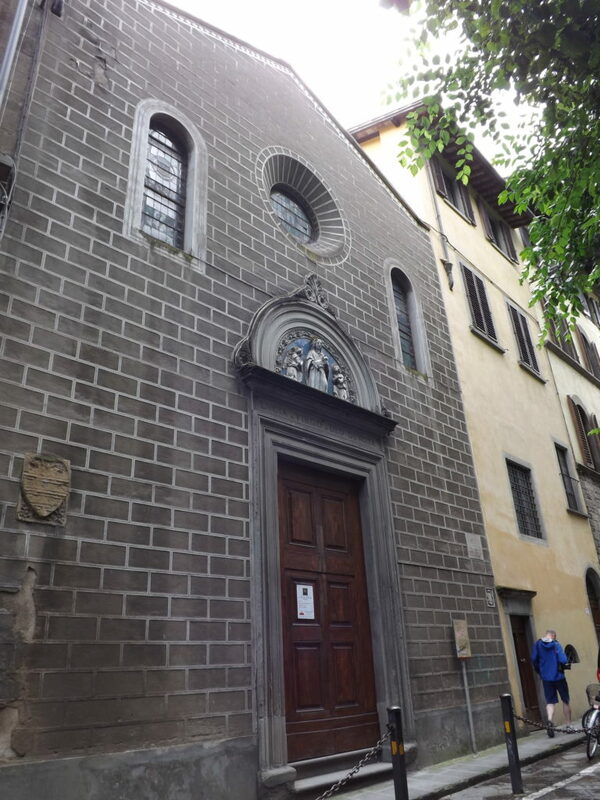 To reach #54, hike the street from its starting point in the Piazza San Felicita. The close confines of the cobbled street, lined by rows of three-storied houses with shutters on windows flung open or closed tight, resonate with Loy’s depictions of the street in the 1910s. Loy’s life on Costa di San Giorgio provided material for her earliest poems, most explicitly the two poems that form part of the triptych sequence of “Three Italian Pictures”: “Costa San Giorgio” (sic) and “Costa Magic” (see Firenze is a woman). Other poems evoke the street, either as a specific street or a more generic sense of street life. Loy’s children ran across these street stones. The neighborhood’s characteristic closeness of homes, bringing neighbors into regular contact with each other, colors Loy’s experience of maternity. Widely considered the first poem about the physicality of childbirth, “Parturition” (1914 Trend) places its “I” in a domestic space on a busy street that also becomes the “centre / Of a circle of pain” in which the “I” grows cosmic in force and self-creation — but also remains within the house and its feminized environs (LLB96 4). Shutters flung open, then as now, allow the outside world into the poem. Through the “open window,” the male “voice” of a “fashionable portrait-painter” is heard as he runs “up-stairs to a woman’s apartment,” a not so oblique reference to the kinds of infidelities she suffered with Haweis (LLB96 5). Loy’s son Giles was born on February 1, 1909, and a customary home-birth would have placed the event in the initial apartment on Costa di San Giorgio. Whether this particular place housed the birth, where other women would have attended, the poem’s final lines indicate the woman-centered rituals of birth on this street, in a domesticized space that men do not enter. The visits of “Each woman-of-the-people” who are “Doing hushed service” and satirized as donning a “ludicrous little halo” are nonetheless present at the emergence of the speaker’s absorption into “infinite Maternity” of “cosmic reproductivity” (LLB96 7). 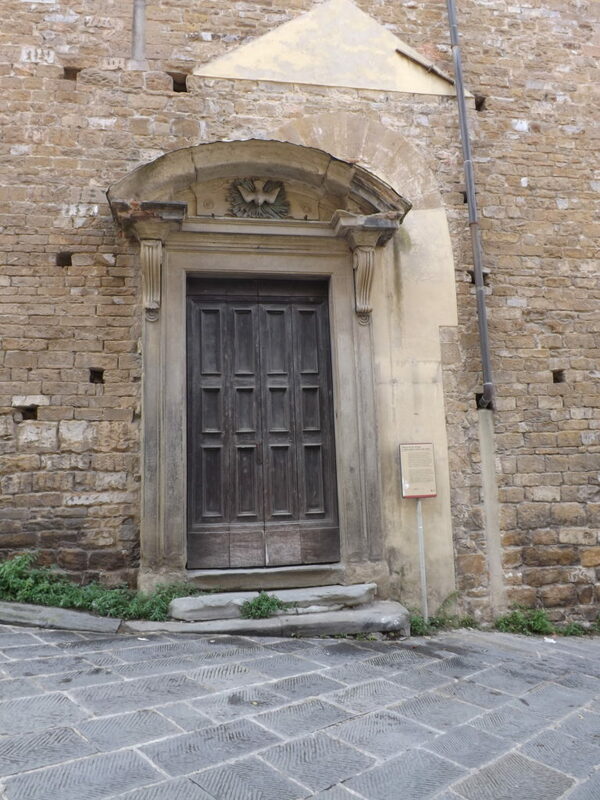 The doors on Costa di San Giorgio are varied and beautiful. In Loy’s poems, they come to signify gendered perspectives, passages, and the tension between mobility and enclosure. Women gather in “At the Door of the House” clustered around a Tarot card reader, “Looking for the little love-tale / That never came true / At the door of the house,” as the poem deromantizes myths of love (LLB96 35). 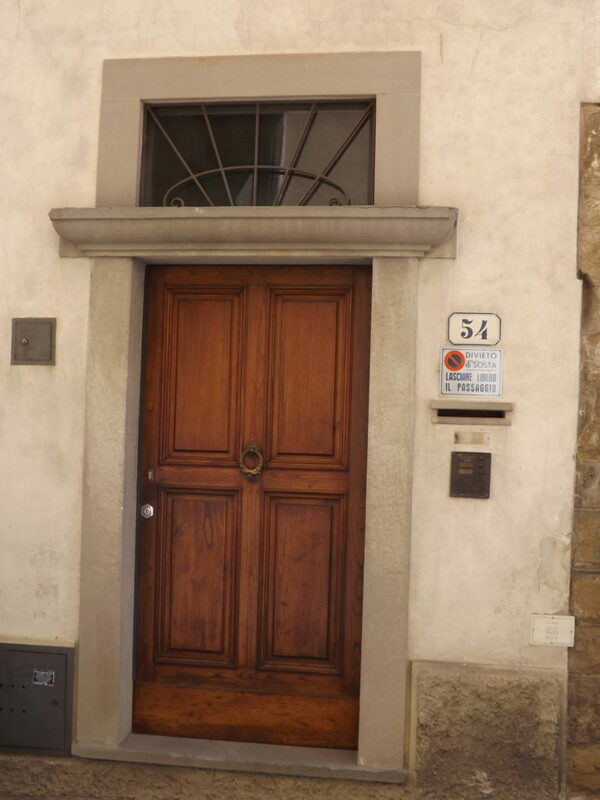 Door to #54 Costa di San Giogio, Loy’s home. Costa di San Giorgio windows, #54 (light beige house) and #52 (yellow house). 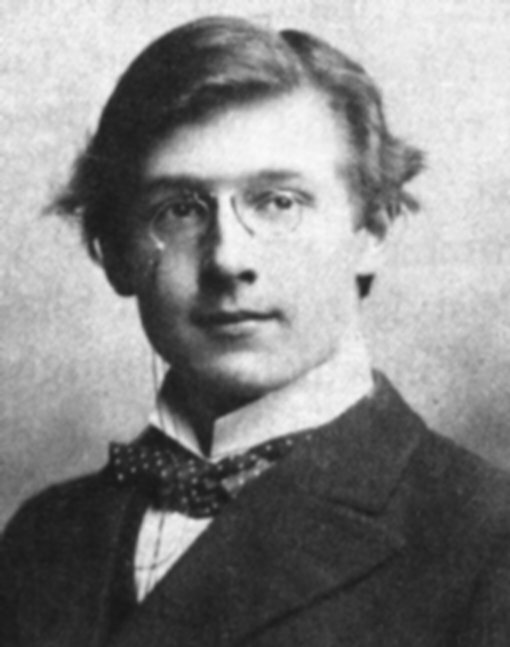 Loy owned the first and rented the second at times. #27 Via dei Bardi, where Loy lived for a few months in 1915-16. Papinni lived down the street. Peer up at windows flanked by shutters. In the heat of Florence’s summer, residents seek coolness in the evening air, spilling from houses into the street, viewed by the watcher at the window in Loy’s 1921 “Summer Night in a Florentine Slum,” in which a British woman gazes out at the activities of the street below her. Conscious of a privileged position of class and nationality, the speaker comes to question that position as she intuits her own complicity in the gender and class inequities she critically observes out the window (see Firenze is a woman). In “Black Virginity,” a commentary on sexuality, religion, and masculine power, an “I in lilac print” observes the crowd. 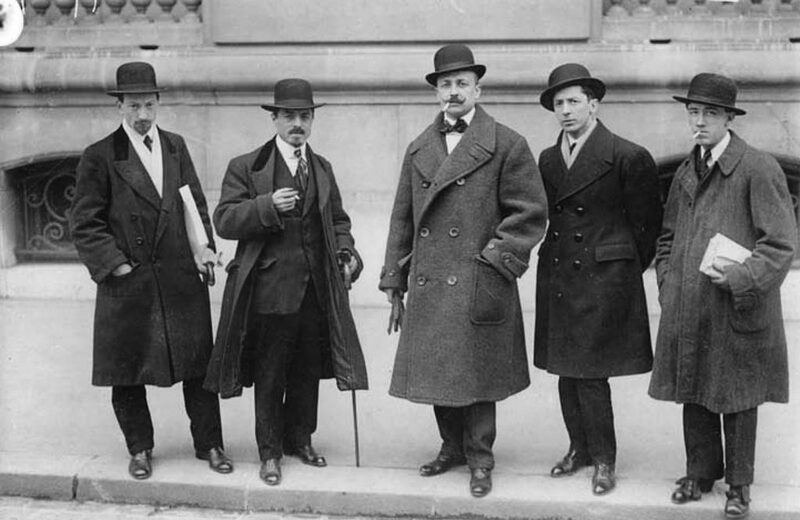 The strollers include a parade of priests, seeming novitiates who emerge from their “hermetically-sealed dormitories” cloaked with “fluted black silk” and a decidedly asexual authority. In their chastity, they dream “Not of me or you Sister Sarminata,” surmises the speaker, who sardonically notes this male authority’s dependence — since Eve — upon viewing woman as the origin of sin: “It is an old religion that puts us in our places,” for woman is made to be “Preposterously no less than the world flesh and devil.” The “Baby Priests” walk with others in the “Yew-closed” “green sward” of the park, alongside an “old man,” busy “Eyeing a white muslin girl’s school.” Through its placement of characters, the poem draws “parallel” lines between this suggestion of pedophiliac lechery and the Church’s denigration of women, reversing the notion of woman as the origin of sin and indicting patriarchal systems (LLB96 42-43). Staging this scene in a Public Garden counterpoints the Biblical myth of the Garden of Eden as the site of Eve’s transgression, suggesting its false justification for the “public” and private forms of masculine power enacted through and upon women’s bodies. Turning eastward from the Ponte Vecchio on the Oltrarno side, the Via dei Bardi runs parallel to the river and just above its walls. 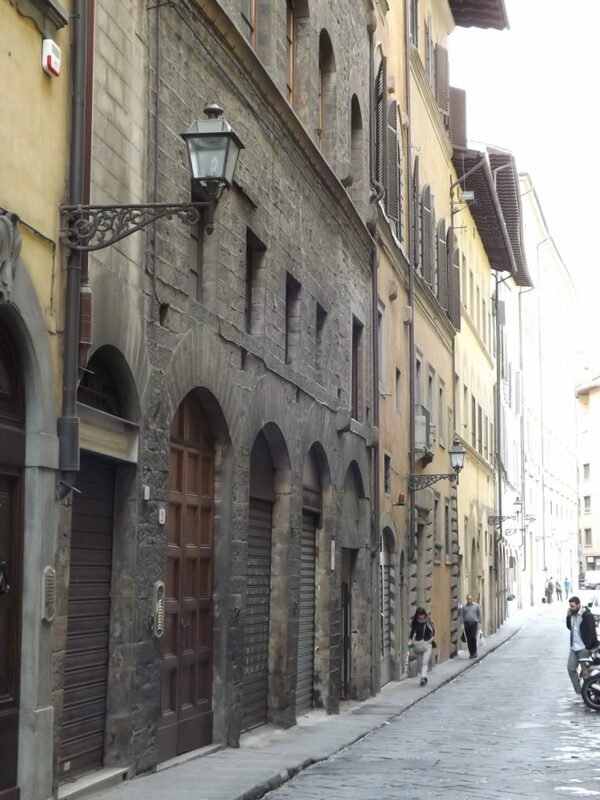 The Baedeker from this period guides tourists to the home of George Eliot’s ‘Romala’,” another Florence connection to British literati, by taking the Via dei Bardi, “which leads to the left just beyond the Ponte Vecchio” (538). Loy marks her literary location on the Arno in several poems, including “Songs to Joannes.” Her apartment windows, perched above the river’s walled banks, open to a view of the Arno. Walking along the Via dei Bardi, with the Ponte Vecchio at her back, Loy would enjoy a view of the river and the mountains rising in a distance outside the city. Loy settled temporarily on the Via dei Bardi when returning from several months in the mountain retreat of Vallombrosa just after the war began. Before leaving for the mountains in June, she had rented the Costa di San Giorgio home to tenants. 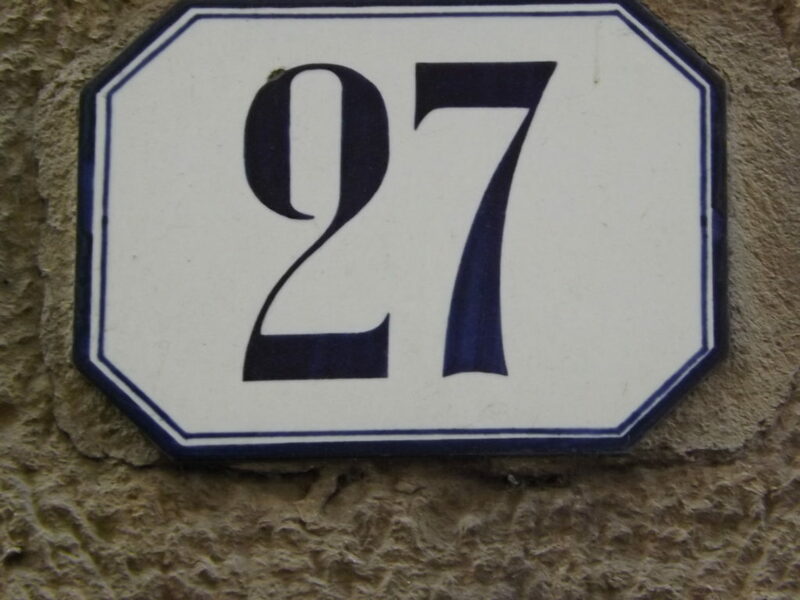 Coming back to the city without her children — who were left in the care of their nursemaid in the mountains as the war intensified — she found an apartment at #27 Via dei Bardi. 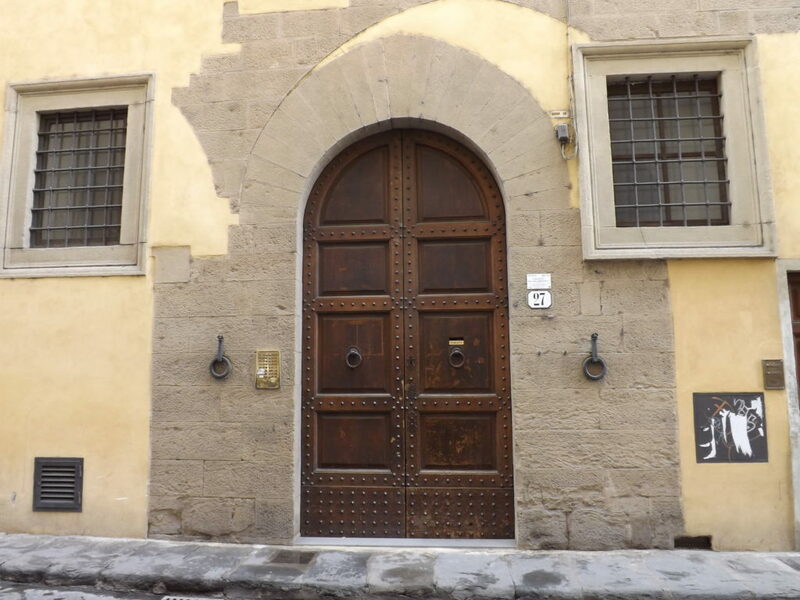 Loy rented an apartment at #27 Via dei Bardi, for a few months in 1914-1915. 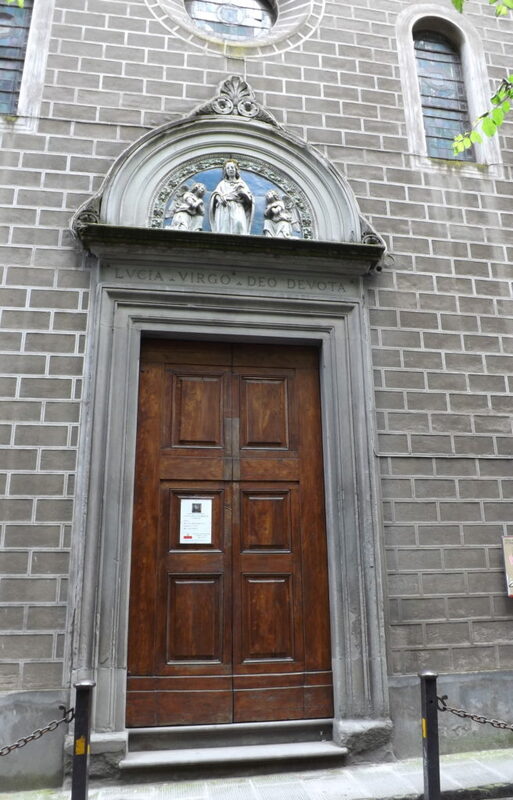 Santa Lucia dei Magnoli, on the Via dei Bardi. For a more sanctioned view of womanhood in this city of churches, the Baedeker directs us to wander down the street, beyond #27, where the street’s main historical interest can be found. 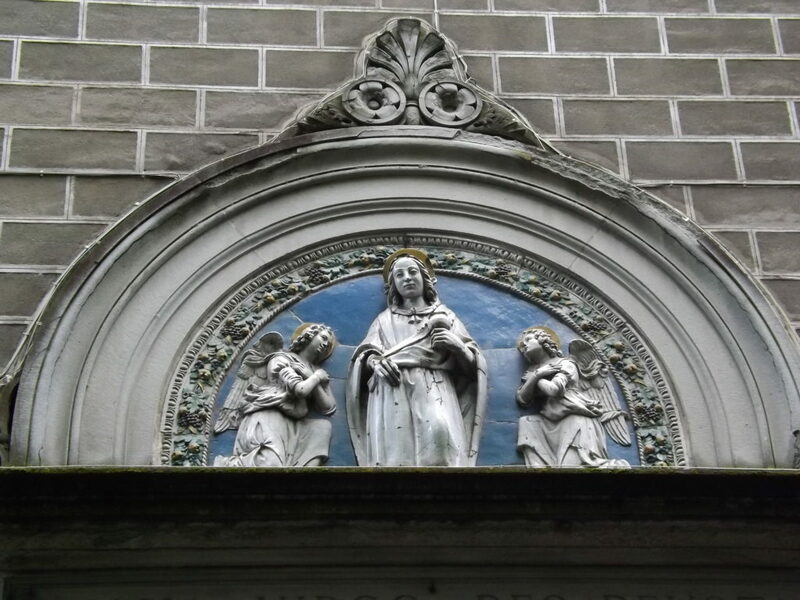 There “rises the small church of Santa Lucia Magnoli,” known for “containing a relief by the Della Robbia above the door, and an Annunciation by Jac. del Sallaio (1st altar on the left)” (548). 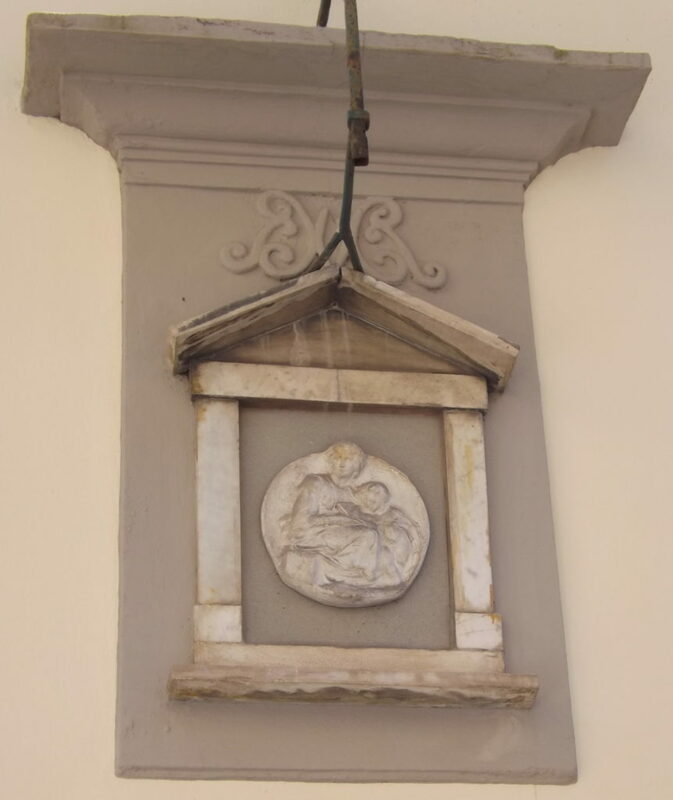 The Della Robia above the door of Santa Lucia dei Magnoli, Via dei Bardi. The wide reproduction of Della Robia images sustained the profitable marketing of religious iconography in the city. Loy’s response to the commodification of such idealizing processes surfaces in Burke’s observation that, “marveling at the number of certified ‘Della Robbia’ Madonnas being shipped to America, she studied the pecking order among the dealers. Such persons conducted business by seeking to ‘fasten their right to exist upon the battered figurines of the Catholic past’” (Burke 124, quoting “The colonial lady artist,” a section among the fragments of Loy’s unpublished prose narrative Esau Penfold). Alert to the circulation of religious iconography as commerce, in an early poem “The Prototype,” Loy implicates religion’s role in enforcing poverty. Just as the poem denounces the idealization of the Virgin Mary as a way to distract attention from social and material realities, Loy maps the religio-economics of womanhood, virginity, and motherhood that pervade other her Italian poetic Baedeker (see Firenze is a woman). Loy left her flat on Via Dei Bardi and returned home to Costa di San Giorgio the spring of 1915. 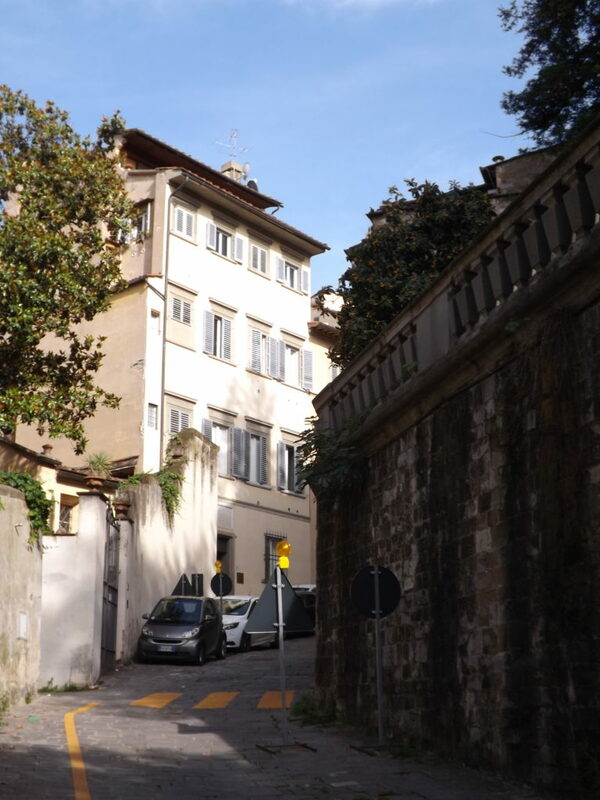 Walking from her rented apartment on the Via dei Bardi back to her Costa di San Giorgio home, Loy might well stroll past the Santa Lucia Magnoli and its Della Robia (traveling eastward on Via dei Bardi), turning right shortly thereafter onto Costa Scarpuccia. 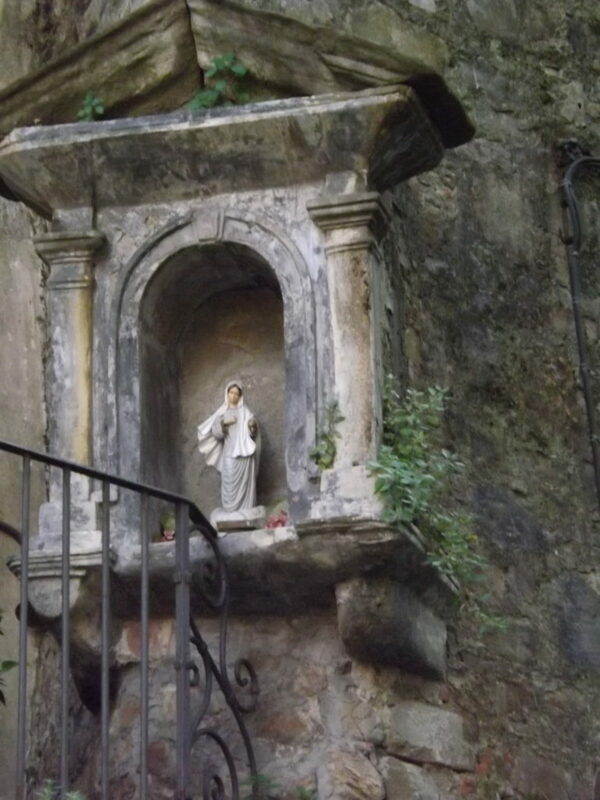 She would pass a small shrine to Saint Francis of Assisi on the right and one to the Virgin Mary just before this turn. 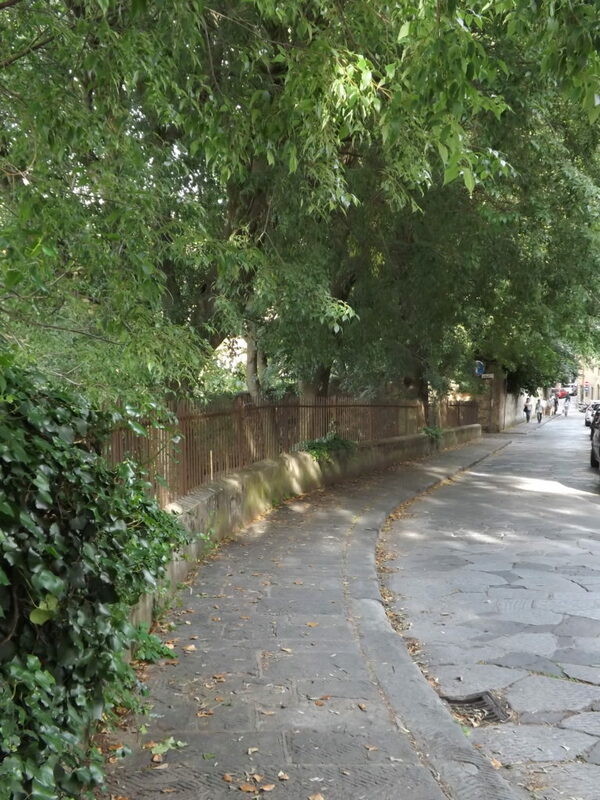 Should you want to trace Loy’s imaginary path, follow the Costa Scarpuccia up the hill, appreciating the shady trees lining the street. Stop midway to catch a splendid view of the Duomo to your right. In a Christmas Eve setting at the Duomo, Loy counterpointed the Duomo’s Madonna with a poor and hungry mother in “The Prototype,” imagining the “birth” of a new social equality rather than the worship of an idealized Virgin and child (see Firenze is a woman). 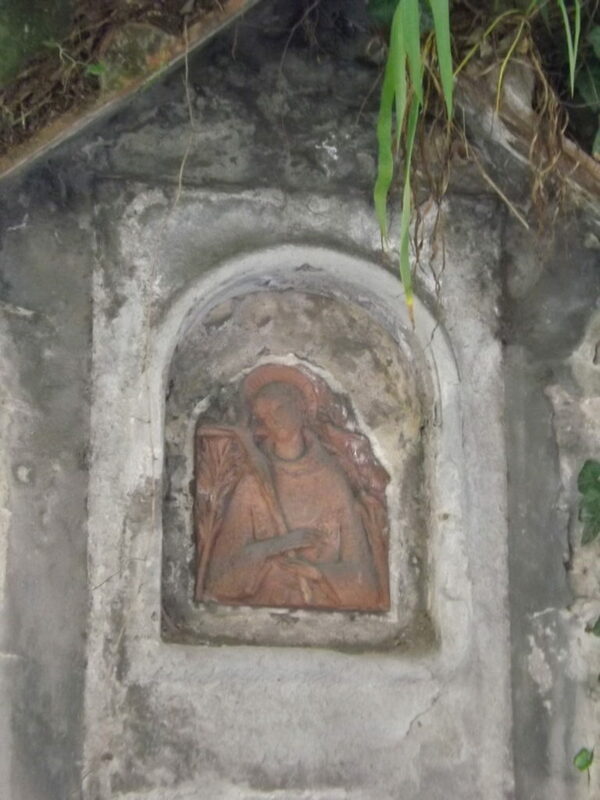 At the top of the hill, cross over the Costa di San Giorgio to descend its lower part, walking toward the city (it will appear as the left street of a fork; the sharp left climbs upward on Costa di San Giorgio) You will be facing a corner building with a bas relief of the Madonna and Child above its door. Costa di San Giorgio, to the left, at its intersection with Costa Scarpucia, looking downhill and toward the city. Loy’s home is a few houses down on the right. 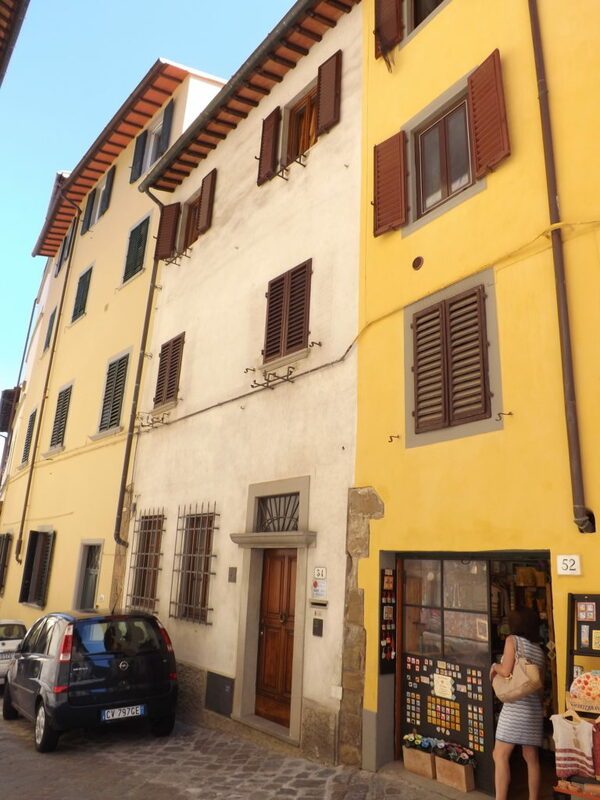 During the Spring of 1915, after several months living at 27 Via dei Bardi, Loy moved back to Costa San Giorgio, staying initially at #52 next door to her still-rented home. Both #52 and #54 sit across the stone street from the Chiesa San Giorgio, a medieval church that once housed Giotto’s Madonna di San Giorgio alla Costa (1295-1300) (removed at some point and attributed definitively to Giotto only in 1939). Madonna bas relief on the exterior of the Chiesa San Giorgio. 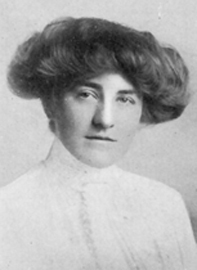 Loy left Florence in October, 1916 to sail alone to New York City, where Frances Simpson Stevens helped her find an apartment and introduced her to the avant-garde circles important to her time there — beginning with the Arensbergs, the Provincetown Players, and Stieglitz’s 291 gallery, and expanding quickly to the Others crowd, imported Dada, and Greenwich Village feminism. Loy’s engagement with the avant-garde began on the Costa San Giorgio, in #54 and #52. and evolved into a feminist en dehors garde in her writing from the Florence years. Visiting her Firenze homes brings to life the stones, windows, doors, and buildings she mapped in her emerging feminist poetics. 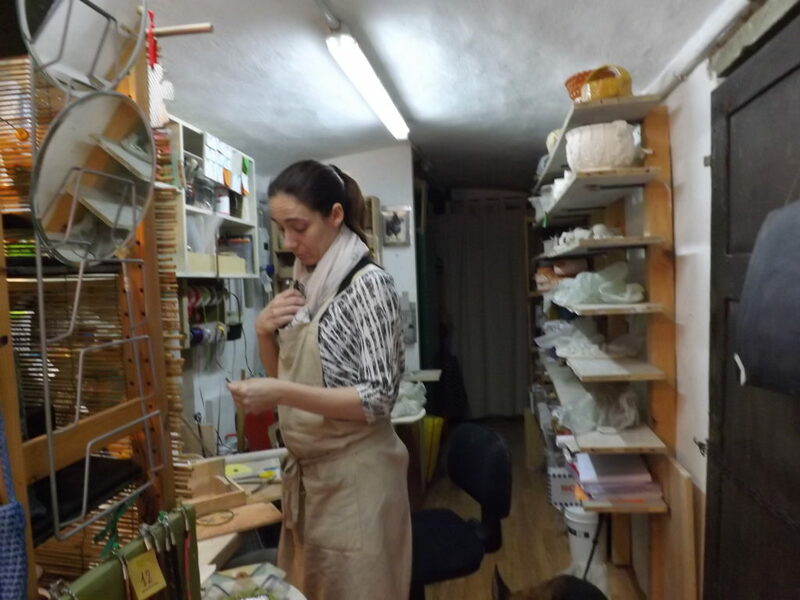 As a wonderful continuance of this artistic spirit, #52 now houses a ceramic artist, Emma Draghi, whose family has owned the home for two generations, since the 1920s. The wide doors of the bottom floor open to the studio and shop, well worth a visit to see her pottery and fabric creations. Shop at #52 Costa di San Giorgio. Loy, Haweis, and Frances Simpson Stevens set up studios at various times in both #54 and #52, where Emma Draghi now makes and sells her ceramics, fabric art, and knitted wears. The spirit of design and creativity across arts imbues her first-floor studios. Take a trip. Who knows what traces of Loy abound? 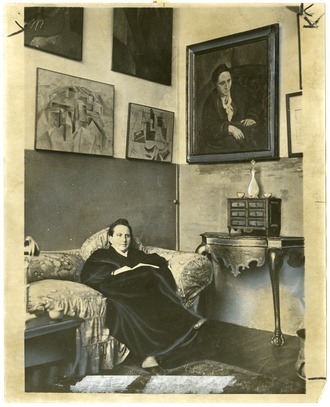 Loy in her Paris studio, before moving to Florence.